Tammy Deitz ~ The Deitz Group -REMAX, 100, Inc.
Tammy Deitz and The Deitz Group, Inc. of RE/MAX 100 take their Real Estate business very seriously dedicating high levels of enthusiasm and determination each and every day. 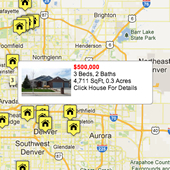 Thousands of Denver area Real Estate buyers use us to search for the perfect home. We have ALL Real Estate Listings in your area. You'll get access to maps, virtual tours, new listing notices, price changes, neighborhood reports and more. Then when your ready, either click to set a showing on your favorite homes or call us directly at 303-202-2281. We are here to help guide you through all of your Real Estate needs.